Don't strike out with parking! Parking.com has convenient parking for all Arizona Diamondbacks home games. With several parking locations within walking distance from Chase Field, Parking.com is the premier choice for baseball and event parking. Click on a location name to find parking information such as rates, hours of operations, entrances, and parking coupons. If a coupon is offered at the location, customers must print and present the coupon at time of exit in order to redeem the discount. Please note: For special events, the Event Rate replaces the Daily Rate. 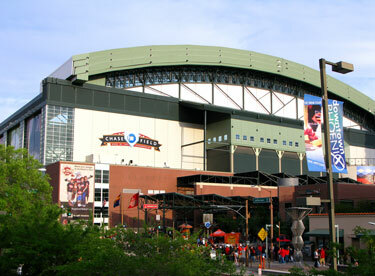 Chase Field is located in downtown Phoenix, and home of the Arizona Diamondbacks of Major League Baseball. On occasion, the venue hosts special events including women's college baseketball games, Monster Jam, AMA Supercross, and concerts.